By default, your Canon Rebel t5i performs a sensor-cleaning routine every time you turn the camera on or off. This automated sensor cleaning normally is enough to keep the sensor dust-free. But if small spots appear consistently on your images, your sensor may need deeper cleaning. The best solution is to take your camera to a repair shop for professional cleaning; it’s not recommended that you clean the sensor yourself because you can easily ruin your camera if you don’t know what you’re doing. Until you can have the camera cleaned, however, you can use a software-based dust-removal filter found in Digital Photo Professional, one of the programs that ships with your camera. You start by recording a data file that maps the location of the dust spots on the sensor. Set the lens focal length at 55mm or longer. Switch the lens to manual focusing. Some lenses have a mark that indicates the infinity position — the symbol looks like a number 8 lying on its side. If your lens doesn’t have the marking, hold the camera so that the lens is facing you and then turn the lens focusing ring clockwise until it stops. Display Shooting Menu 3 and choose Dust Delete Data. The camera performs its normal internal sensor-cleaning ritual, which takes a second or two. Then you see the instruction screen. Position the camera 8 to 12 inches from your white paper. The paper must be large enough to fill the viewfinder. 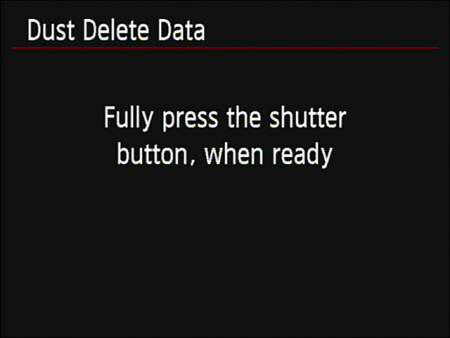 Press the shutter button all the way to record the Dust Delete Data. The current date appears on the initial Dust Delete Data screen. After you create your Dust Delete Data file, the camera attaches the data to every subsequent image, regardless of whether you shoot in the fully automatic or advanced exposure modes. To clean a photo, open it in Digital Photo Professional and choose Tools→Start Stamp Tool. Your photo appears in an editing window; click the Apply Dust Delete Data button to start the dust-busting feature. The program’s Help system (choose Help→Digital Photo Professional Help) offers details.